Researchers from F-Secure, Webroot, and Avast have uncovered Janicab.A, a new trojan that was discovered as a threat to Macs last week and Windows users on Monday, with findings being published recently. For OS X users, Janicab.A was signed with a valid Apple Developer ID and also uses a special unicode character known as a "right-to-left override" (RLO) that is used in email malware attacks. From there, the trojan uses a YouTube page to hijack infected computers, directs them to command-and-control (C&C) servers, and then leaves the server and hides the infection by making the malware appear as a harmless PDF or DOC file. After a relatively long lag period without seeing any particular new and exciting Mac malware, last week we saw the surfacing of a new and interesting method of compromising the OSX system. Malware authors have taken a new approach by altering file extensions of malicious .app packages in order to trick users into thinking they are opening relatively harmless .pdf or .doc files. Changing file extensions in Mac OSX can be tricky due to a built in security feature of the OS that detects attempts to change the extension and automatically annexes the extension of its correct file or package type. This news comes after Apple updated security definitions to combat 'Yontoo', an adware trojan this past March, while also regularly dealing with Java-related vulnerabilities. Apple introduced Gatekeeper in OS X Mountain Lion in order to better deal with security threats, offering a way for users to restrict installation of apps to those signed by Apple-issued Developer IDs. Cross-platform malware? And the Mac version was released first? Yaaaay! Not all OSX users have Adobe Acrobat Reader installed. Icon FAIL. 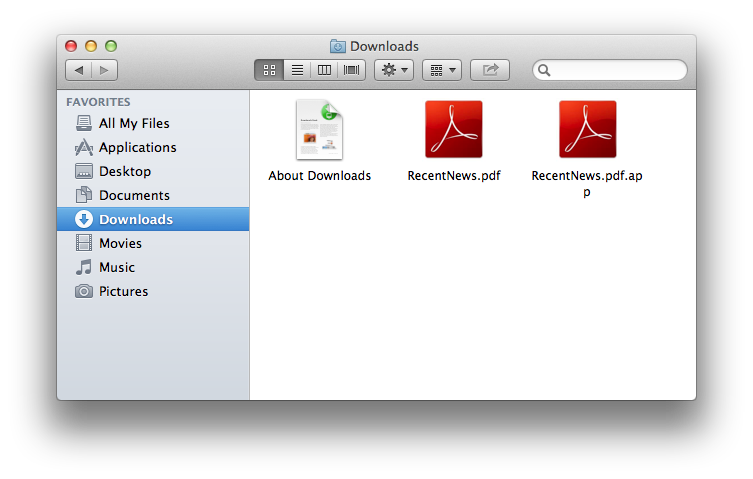 Should've used Preview.app PDF icon instead. Malware authors have taken a new approach by altering file extensions of malicious .app packages in order to trick users into thinking they are opening relatively harmless .pdf or .doc files. New because of the .app part maybe, but .pdf.exe is not a new approach by any means. Still, don't get surprised if people that don't even have the adobe reader installed on their mac will still open a "pdf" that is using the acrobat icon. There are users and users. Apple's dev team is busy re-building a broken dev portal. We might have to wait until after they get us back on line to revoke certs. I don't think software engineers build web pages. Not in this case at least. Reminds me of that 'New Folder' virus that used to infect XP back in the days. It used XP styled folder icon. So when you are using icon packages the threat was half gone.